Cobblers assistant boss Alan Knill insists there will be no rotation of the Cobblers squad for Saturday’s FA Cup second round tie against non-League Northwich Victoria at Sixfields. The visitors play in the Evo-Stik Northern League Division One North, and are the lowest ranked team left in the competition. The step they play at is the equivalent of the Cobblers’ county neighbours Daventry Town and AFC Rushden & Diamonds, but Knill says Victoria will be ‘treated like any other opposition’. 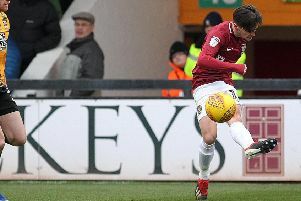 The Cobblers will have to make one change as central midfielder John-Joe O’Toole is serving a one-match ban after he picked up his fifth booking of the season in last Saturday’s 2-0 win over Yeovil. Town used matches in the Capital One Cup and Johnstone’s Paint Trophy earlier in the season to give squad players a runout, but the policy was not implemented for the first-round FA Cup win at Coventry City, and Knill says it will be a similar story this weekend. “There is a change in midfield, but we have talked about it and it is such a big game for us,” said Knill. “We talked about the banana skin that the Yeovil game was on Saturday, and this weekend is also a massive one for us. “We want to progress, so any changes we have or we make will be forced changes, because we want to make sure we put out our strongest team. “We want to make sure we go through and it is a really tough game. “Chris watched Northwich against Boreham Wood, I watched them last Wednesday, we had them watched again on Saturday, and it is going to be a difficult game for us. Long-term injury victim Paul Corry aside, the whole Cobblers squad trained on Tuesday. Jason Taylor is likely to be the man to replace O’Toole alongside Joel Byrom in the centre of midfield, while Ricky Holmes is likely to once again start the game on the bench.